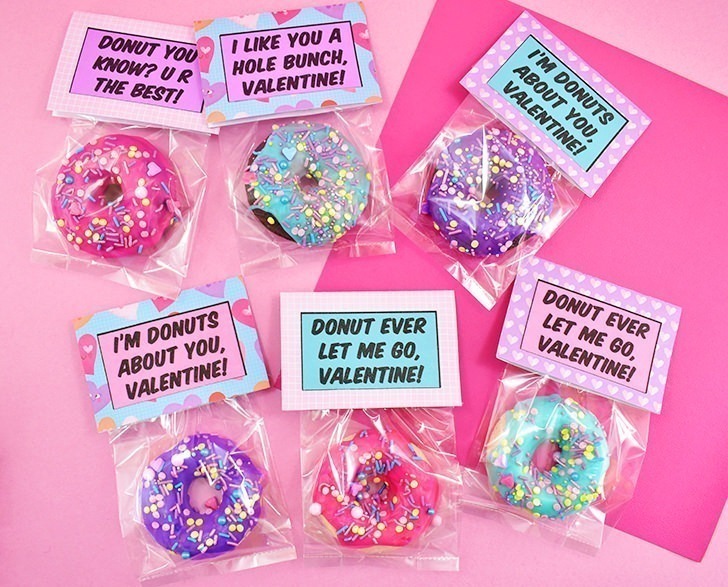 Donut you know that donut Valentines are the most perfect Valentines of all time?!? Guaranteed, the kiddos are going to like them a HOLE bunch! Donuts are one of the finest accomplishments of the human race if you ask me. And if you don’t agree, I’m not quite sure what you’re doing here right now :) Because this is totally a celebration of all things lovey-dovey (well, maybe that’s a bit strong) and DONUTS. 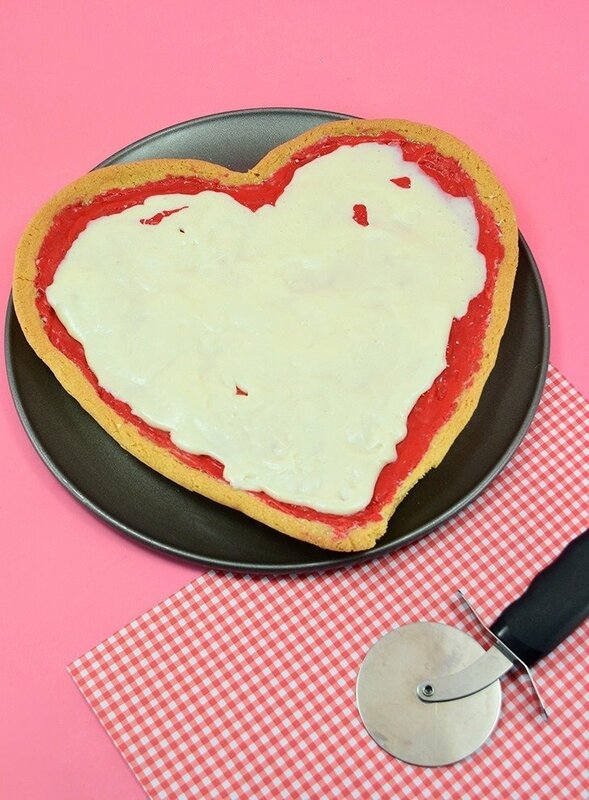 I was trying to think up what would be the BEST Valentine I had ever gotten and I pretty much instantly thought “a donut”. Boom. 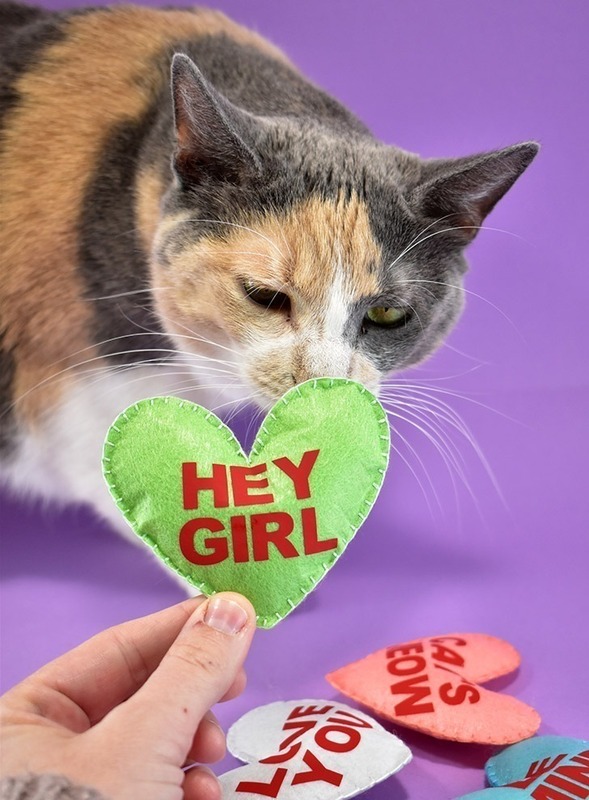 We’ve only got 4 days until V-Day but here we are rocking my dream out into a sweet and colorful Valentine’s Day reality. Since I have to do the whole gluten free thing, my donuts were homemade from a box mix. But I’m guessing that the majority of y’all can run to the bakery and snag a dozen (or two, or three, or whatever if necessary) really quickly and then knock these sweet babies out. Because after you get the cards printed and cut, it’s just assembly lining these babies OUT. In making this project I wanted to be sure that this is something the little ones can help out with. 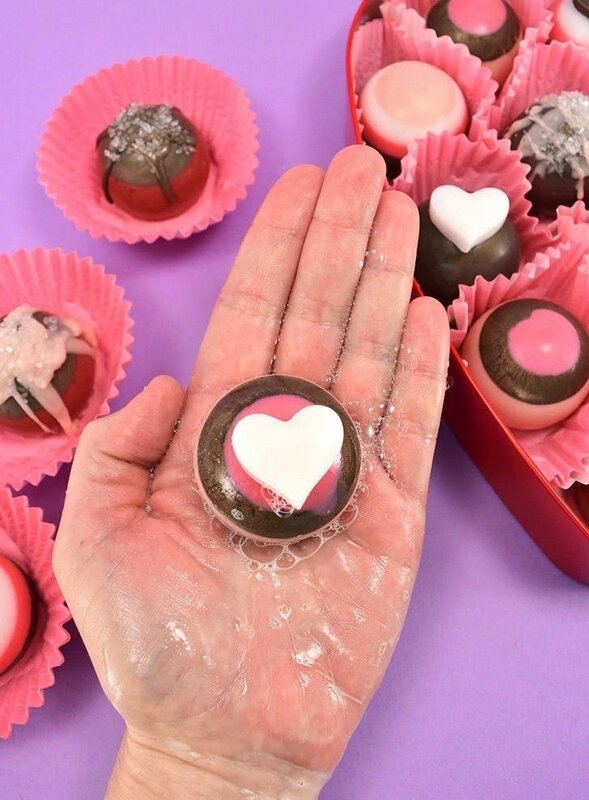 Instead of making a printable you simply print and cut out and move on, these Valentine donuts are a little more hands on. 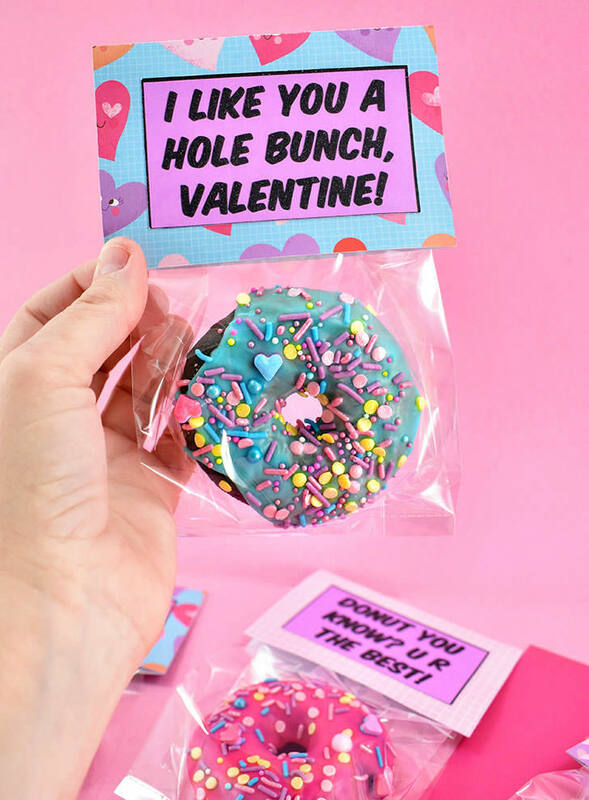 You’ll need to cut 3 pieces of paper out for each donut… You’ve got the big card that is made from patterned paper to cut out and then two smaller pieces, one with your hilarious donut-centric Valentine’s Day saying and then one that your kiddo can fill out with the “to and from”. Now I know that it’s so much easier to just print business out and maybe even scan in and put your kid’s name on all of the cards so that they don’t have to mess with it and then not even bother to add names to each of the Valentines, but I think there is something really nice about the littles actually taking the time to do these things. Did you ever occasionally get the Valentine’s Day card in your little cardboard box that you had spent a lot of effort decorating to reflect YOUR INNER ROMANTIC SOUL and find cards that people just tossed inside without filling in the “to:” only the “from:” and sometimes you wouldn’t even get that at all. Just a blank Valentine with Transformers or something on it and no clue who even gave it to you. I guess it bothers me because it seems like the easy way out. It’s kind of lazy. It doesn’t show the people around you that they are worthy of your time and effort. 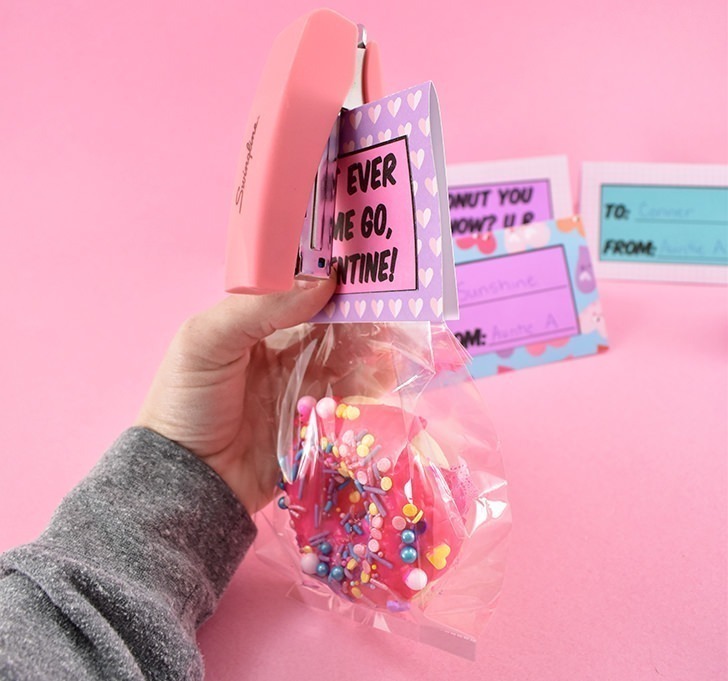 And, people, let me tell you I personally have had my FILL of lazy in the last few years and so these Valentines are simple and easy but require a little bit of effort. Not a ton but enough to mean something a little special, right? 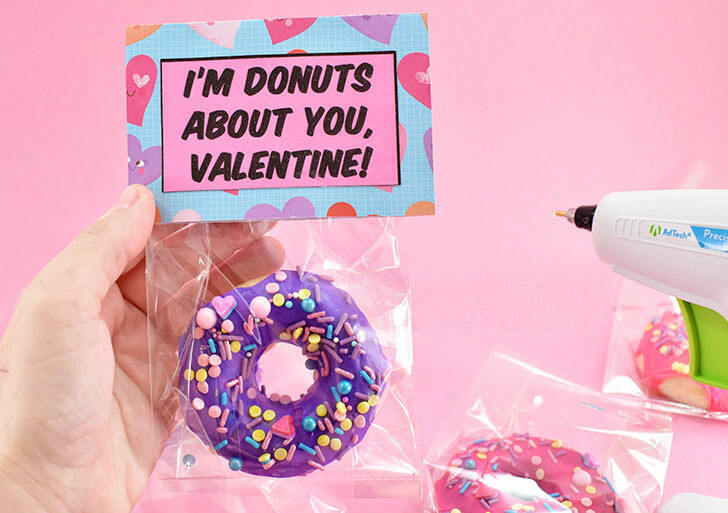 Let’s rock out some adorable DIY Donut Valentines. 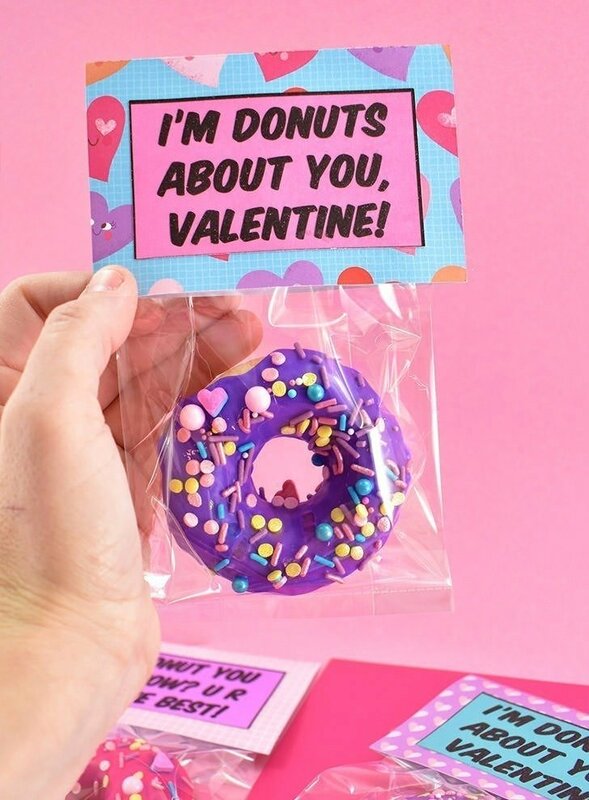 Before we get started making packaging for our donut Valentines, you’re going to need donuts, right? Since I’m gluten-free and wanted to actually get to eat a donut or two (or a donut or two DOZEN) I made my own with gluten free cake mix. I used this Wilton donut pan, though I was a dummy and with other pans already in storage I decided to only buy one and baking 36 donuts only 6 at a time was a little bit time-consuming. 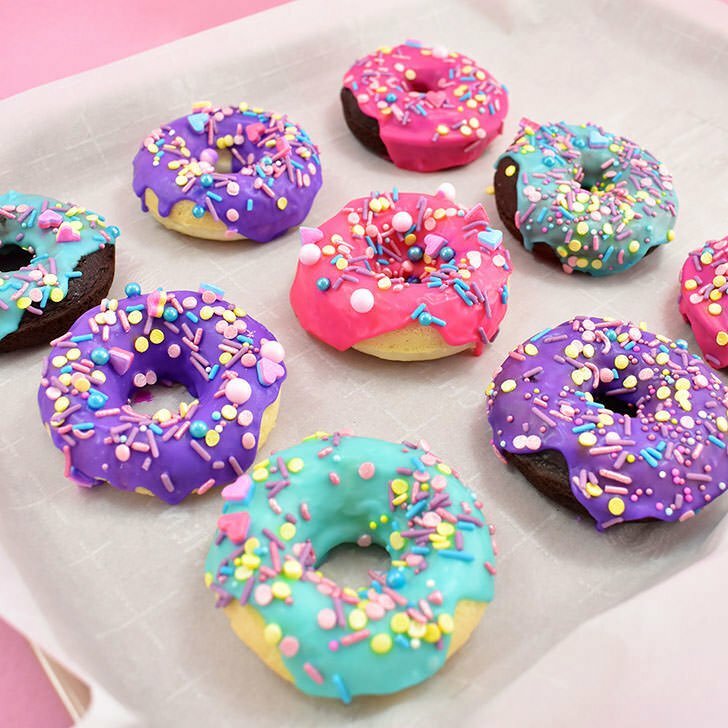 I also used these amazing Galentine Sprinkles, which are also gluten free – heck, yeah -to give my donuts a bit of pop. 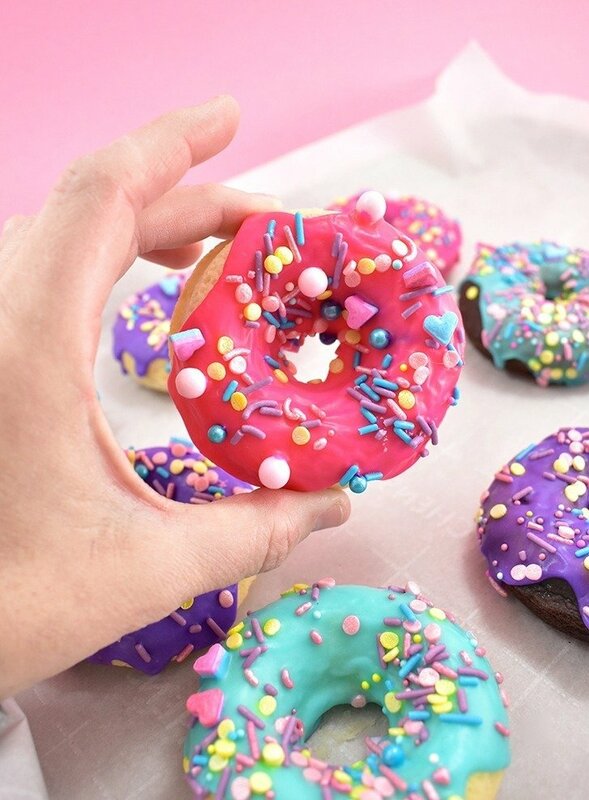 If you don’t need to do the gluten free thing, you can buy your donuts from a donut shop or bakery and if you ask nicely you might even get to select icing colors and decorations or whatnot! If you get to buy your donuts this business is going to be super duper quick, huzzah! Fold the flap over so that the amount of cellophane up to that fold is about 3.5″ and staple the bag shut. FYI, some bags are 6″ tall so you’ll have a smaller flap than these 9″ tall bags in the photos here. Donuts aren’t known as a health food and my first few attempts had this weird greasy smudge that went all along the backside of the bag and it was super obvious and kind of grody looking. If you slide your donuts into the bag icing side down, you won’t get that gross streak. 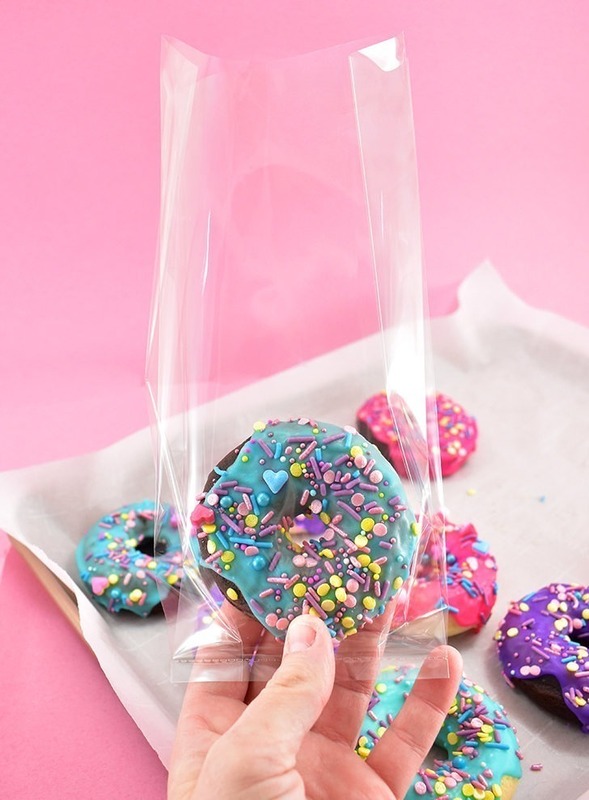 Also, if you turn your donut upside down and give a gentle shake prior to bagging, you’ll dislodge any sprinkles that aren’t well attached so you don’t have a whole bunch at the bottom of your bag. 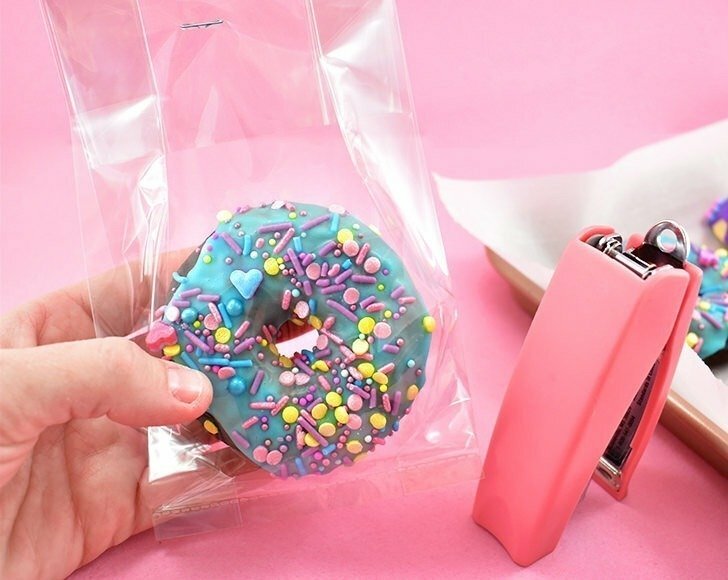 Bag up all of those donuts so you don’t have to worry about them getting stale on you, even if you don’t have your Valentine tags printed and ready to go, just yet. 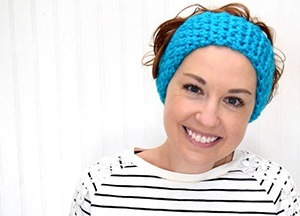 When I was planning out this project I realized that different kids (and adults) prefer different styles of things and so I wanted these to be totally customizable. Instead of creating a printable with a pattern that you would be stuck with, we’ve got a simple black on white printable that you can print on any cardstock you like that you then attach to a folded piece of cardstock in any printed pattern you’d like. If your kid digs all things camo, there you go… get camo patterned paper from the scrapbooking section of your craft store. If they love girly pink hearts, rock that business out, instead. The folding and largest portion of the card is the part made with the patterned stock. You can use this Cricut Design Space file that’s already ready for you, or you can make your own cut file in your cutting program of choice by making rectangles that are 4.5″ x 6″ wide that are scored and folded down the center at the 3″ mark. You can also cut these out by hand super easily if you have a paper cutter that has a scoring attachment thingie with it, like this one. 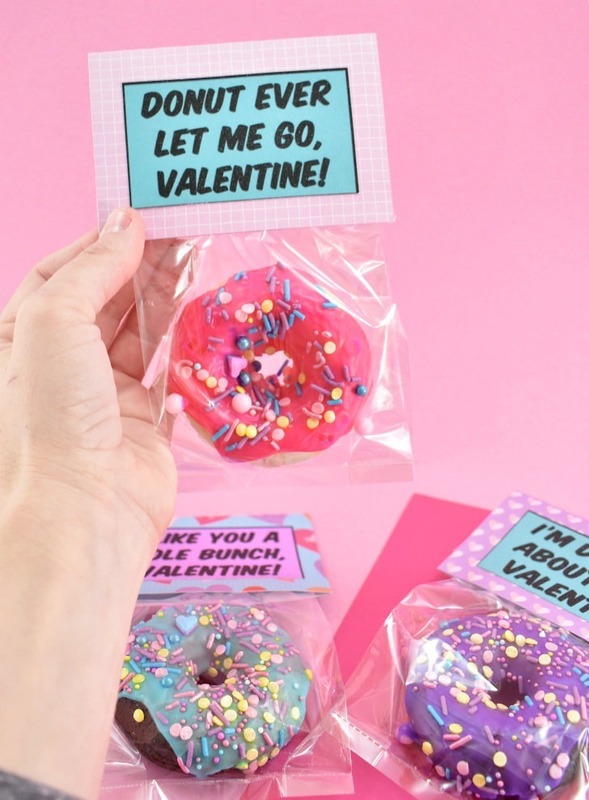 If cutting by hand, snag the Donut Valentine Printable PDF pattern file here. And just because things can get confusing the way I gab, let’s cover the handmade portion again, cut your folding cards to be 4.5″ x 6″ folded in the middle at the 3″ mark. The wording paper of your cards has a thick, black border to help you see where to cut if doing by hand. It also gives it a nice distinction between the background and the text, which I really liked. If using a machine, grab those individual JPEG images and add them to Cricut Design space. When uploading you’ll want to select “print and cut”. Get as many as you need placed in your cut file and then print them as needed and cut them with your Cricut Maker after. 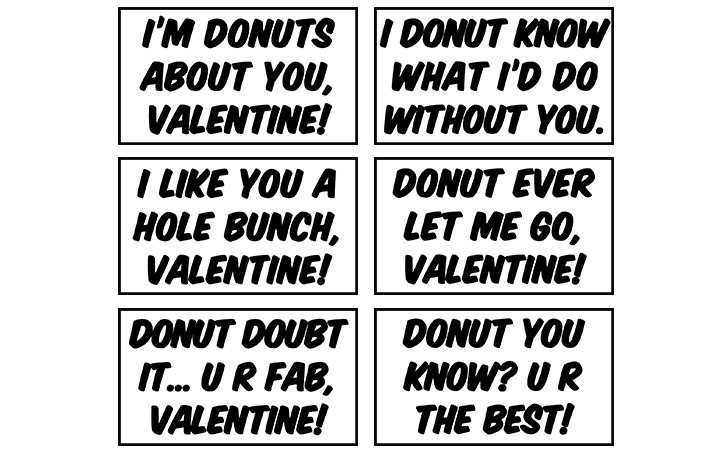 And be sure to print one “to and from” card for every Donut Valentine you make. To make your own Valentine sayings, you can download this free font, Komika Title. You’ll want each of your cards to be 3.5″ x 2″ to neatly fit in the center with a nice frame of your patterned paper behind them. Okay, so… my initial idea was to staple these suckers onto the cello bags, but that didn’t work because I have an itty bitty stapler. Womp, womp. It would totally work and be super fast if you have a standard sized stapler and not a baby one like I do. Since I messed up and I didn’t want to run to town to buy a new stapler I hot glued my cards onto the bags and it really wasn’t very hard, just took a bit more time than stapling. Whichever method you go with should be totally fine. 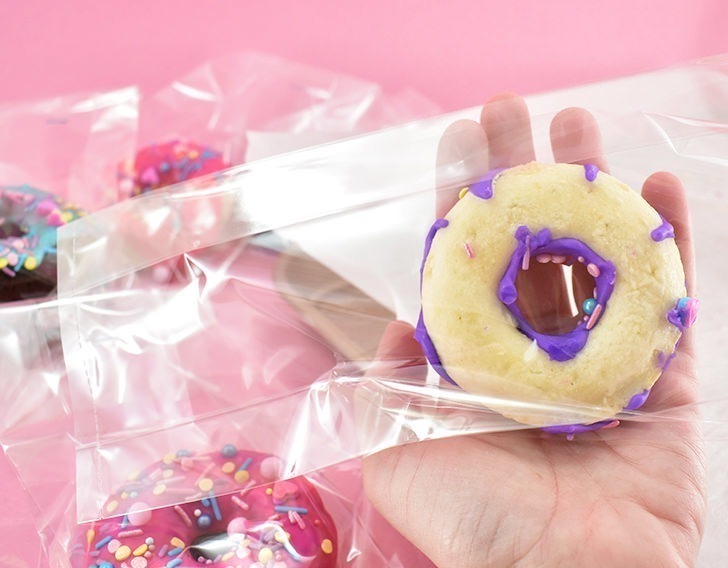 I’ve had my homemade donuts bagged for the day and they seem to be doing well inside of the packaging… not drying out or taking on too much moisture. If you didn’t know, here in the Houston metro it is stupid humid, so that was a definite concern. 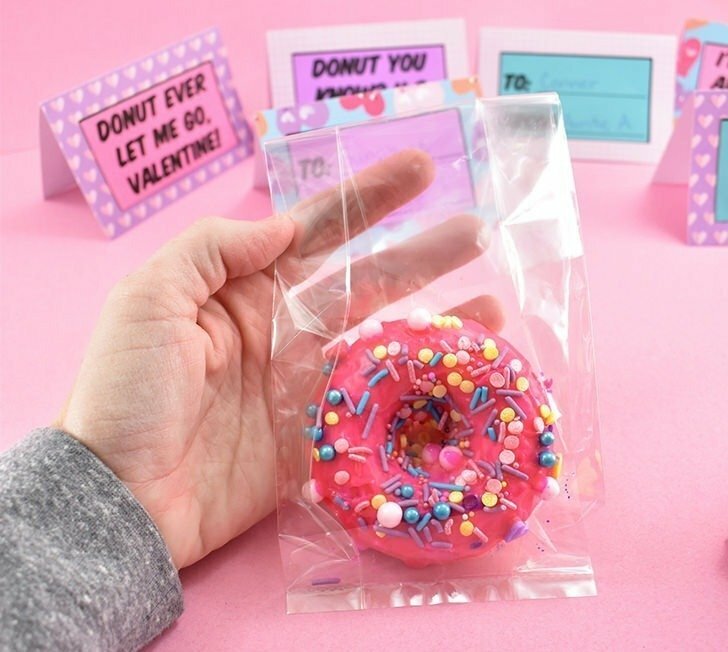 These donut Valentines are really easy to put together and it can be done the night before you or your little hands them out for the holiday. 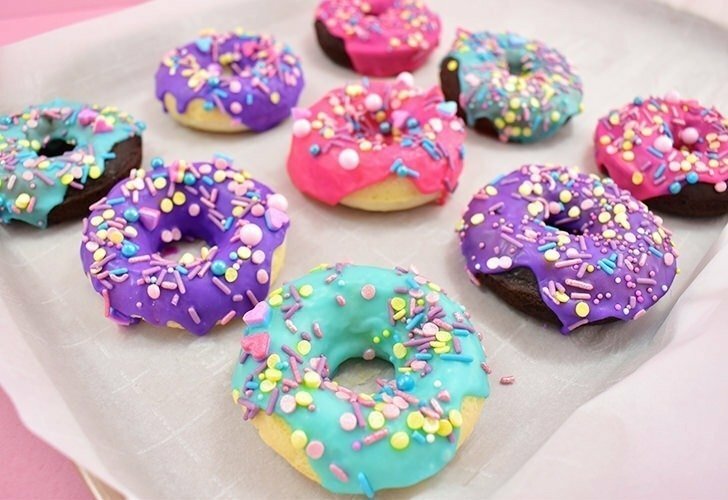 Plus, they’re super cute and who the heck doesn’t love donuts?